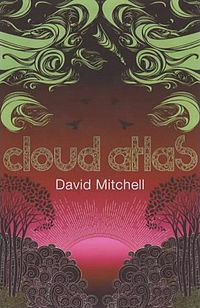 Read Cloud Atlas (2004) by David Mitchell several years ago, which is now becoming a film direct by Tom Tykwer and the Wachowskis, of Matrix fame, with big name actors such as the ever sinister Hugo Weaving, Jim Broadbent, Tom Hanks, Halle Berry & Hugh Grant . It has a narrative structure that I would have thought would make it difficult to film but given the relative success of movies like "Inception" I guess that more complex narrative structures are a genre that have greater appeal now, as compared to David Lynch's (1997) "Lost Highway" in which you have the film divided in two as two narratives that are distorted mirror images of each other, which has a cult following. Given there is a chronological order to "Cloud Atlas", in which each story breaks off halfway through with its central post apocalyptic future, it should be fine, in fact I kind of wish I had not read the book so I could enjoy the movie more. There are plot twists and scenes that could be great if you don't know about them. Willfull ignorance of a novel and appreciating its content in other media is something that I "achieved", if by passively not doing something is an "achievement", with the whole "Game of Thrones" thing thats been popular for the last two years, despite having acquired two copies of George RR Martins "A Game of Thrones". I am assured they are good and will read them when I have more spare time in a couple of months. One thing I found about the novel is its "nature red in tooth and claw" portrayal of human compeditiveness, the grand narratives that provide meaning to the more personal relationships of people and provides validity to exploitative social relations, there is supposed to be hope but I pretty much took in its bleak portrayal of human nature. Perhaps the movie version will be more "hopeful".